April is IBS Awareness Month! IBS, or Irritable Bowel Syndrome, is an intestinal disorder that causes stomach pain, gas, diarrhea and constipation. With estimates of 30 million people in the US alone suffering from IBS, it’s more common than one might think. While IBS is medically manageable, there also are holistic and natural remedies that can help alleviate symptoms associated with the syndrome. The first step to feeling better is being aware of what makes you feel worse. Pay close attention to what you’ve eaten when you start to feel discomfort. Start keeping a journal of what you eat and how you feel afterward. Dairy products (cheese, milk, cream) and acidic foods (lemon, tomato sauce, soda) are common culprits of stomach issues. Start cutting out foods that you suspect are upsetting your stomach. And, don’t worry, there ARE tons of healthy alternatives--like coconut milk and soy cheese--to replace whatever you may miss from your diet. In all treatments, we must remember that there is no one-size-fits-all solution. The key is to know your body and how it reacts to the ways we try to treat it. Making a few important but simple lifestyle changes can help to alleviate the symptoms of IBS and other digestive disorders like indigestion, acid reflux and lactose intolerance. While stress does not cause IBS, it can absolutely worsen the condition (and other digestive disorders). While all stress is not completely avoidable, try to figure out what triggers your stress and, if you can, stay away from things, people or situations. Have a stress management go-to plan, so you’re prepared when those triggers arise. Easy ways to deal with stress include counting to ten, deep breathing, meditating or simply getting a breath of fresh air. It may sound too simple to be effective, but, trust me, it helps. Besides changing your diet and controlling your stressors, adding a probiotic to your routine is a concrete way to create a healthy gut. Probiotics can help regulate your bowel function by repopulating your digestive tract with healthy bacteria that is often depleted through the use of antibiotics. Be careful, though, when selecting a pill probiotic as they are not all created equal. Many of the supplements you find at big box retail stores like Target and Wal-Mart contain fillers and additives that are harmful. 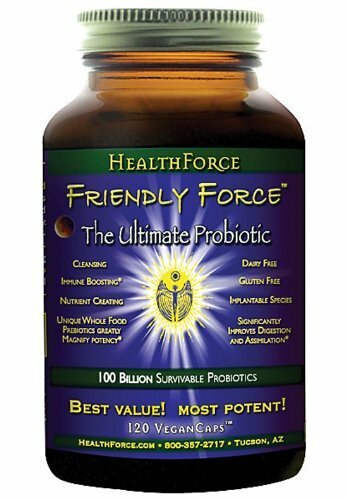 I personally take a vegan probiotic by HealthForce (right). In addition to probiotic pills, many foods, like yogurt, sauerkraut and Miso soup, have natural probiotic qualities. Newer PostMy 30-Day Yoga Challenge is here!